WFTO members are social entrepreneurs and artisans, farmers and campaigners, innovators and Fair Trade pioneers. They join together as a global community showcasing a new business model that can prioritise a social mission. Fair Trade Enterprises can be social enterprises, cooperatives, family-businesses and social businesses. They have all adopted practices and structures that give priority to workers, farmers and artisans in their business decisions. They were born as alternative models of business in the struggle against inequality and injustice. A Fair Trade Enterprise has Fair Trade as its identity. This means a full commitment to the 10 principles of Fair Trade as their core mission. WFTO members have been assessed by their peers and have been independently audited to confirm this. The WFTO Standard looks at every aspect of a business and confirms whether it is truly a Fair Trade Enterprise. The WFTO verifies that the entire business and its systems for managing their supply chains have embraced Fair Trade. The label is the symbol of Fair Trade enterprise. Verified WFTO members use the label to tell consumers, customers and their communities about their identity as a verified Fair Trade enterprise. As members, many can use the WFTO label on their products. WFTO’s mission is to enable producers to improve their livelihoods and communities through Fair Trade. WFTO is the global network and advocate for Fair Trade, ensuring producer voices are heard. The interest of producers, especially small farmers and artisans, is the main focus in all the policies, governance, structures and decision making within WFTO. WFTO is the leading network of the Fair Trade movement. Its principles define the practice of Fair Trade. Provide an environment for sharing and learning that enables WFTO members and others to strengthen their Fair Trade practices. Create market access opportunities for members through a credible Fair Trade Guarantee System. Promote and raise awareness of the Fair Trade model. Advocate for change to conventional trade. Enhance the WFTO’s capability to deliver value added services to its members. As a global network, WFTO is supported by five regional branches through their respective offices. The office in Culemborg, the Netherlands, coordinates the activities of WFTO worldwide. WFTO also works closely with several country networks that support Fair Trade. 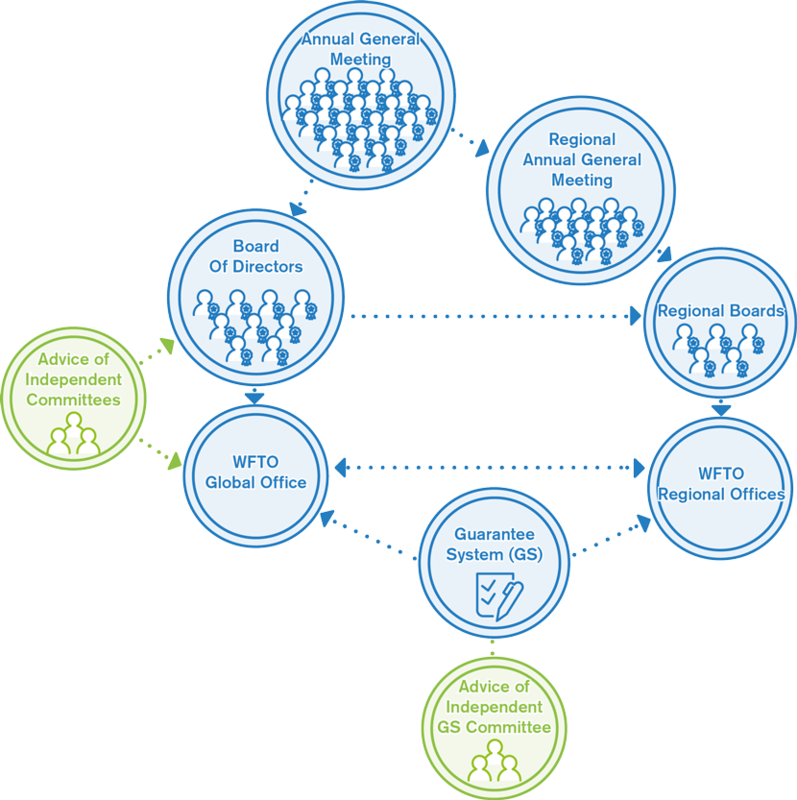 WFTO follows the simple structure of an Association. Members gather during the Annual General Meeting (AGM), which is the highest governing body that elects the President and all Directors. The President and the elected Directors, including five directors nominated by each of the WFTO regions, comprise the five-to-eleven-members Board of Directors of the WFTO. After the elections in the 2011 AGM, the WFTO Board is currently composed of nine people. The Board of Directors is responsible for the management of all WFTO activities. They serve for limited terms of office of four years (renewable), as specified in the WFTO Constitution. The Board appoints staff to implement the strategic plans as approved by the AGM. The WFTO staff is led by a Chief Executive. Committees, working groups and WFTO representatives are appointed by the board of directors to assist staff and other operations of WFTO. WFTO presence spans across the five major continents. WFTO operates through five regional branches located in Africa and the Middle East, Asia, Europe, Latin America and the Pacific (including North America and Oceania). Members of each respective region gather during their own (regional) Annual General Meeting (AGM). They elect their own regional Board of Directors (according to their respective Constitution), which coordinate closely with the global Board and also hire regional staff. Regional operations are closely coordinated with the global office and other regions. Download a PDF copy of the WFTO constitution here (and the legal version in Dutch here). Read the History of WFTO.